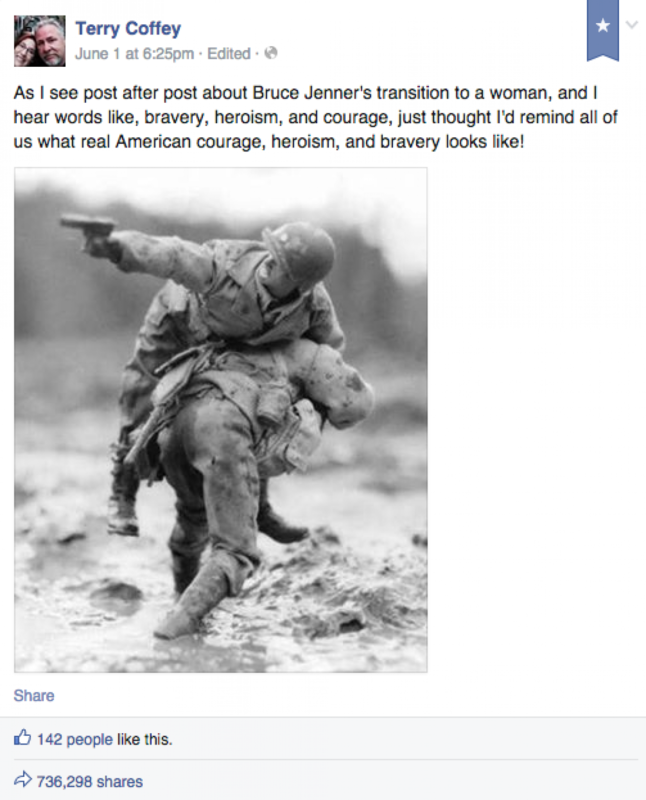 Why do we need to belittle anyone's bravery by comparing it to someone else's? The answer is bigotry towards transgendered people, plain and simple. The only reason to disparage the true courage it takes for any transgendered person to live openly and honestly is transphobia. The top photo meme is a lie. Noah Galloway is a truly brave man. We should honor is service and his loss. However, he was never a "runner up" for this award. In a statement to MTV News on Wednesday (June 3), an ESPN spokesperson confirmed there is “no such thing as a runner up for the three major awards,” referring to the Arthur Ashe Courage award, the Pat Tillman Award for Service and the Jimmy V Perseverance Award. Also, The Terry Coffey facebook post has been updated by Terry himself which has some humbling irony that he rightly points out. Here is the best meme I seen about this issue, by far!